China headquartered Huawei Technological Co. Ltd. is a multinational networking and telecommunication equipment manufacturing company which was founded in 1987. Huawei’s honor range of Smartphones such as the 5X, Holly2 Plus, 7, Bee and 4X are now available on Amazon India at attractive prices. As per your budget and requirement, you can now opt for any of these devices to enjoy the best in communication and entertainment. If you are looking for a Smartphone at a reasonable price, then the honor Bee fits the bill well. The neatly designed handset sports a 4.5 inch LCD capacitive touchscreen display with a resolution of 854 x 480 pixels. The phone is powered by a 1.2GHz Quad Core processor and 1GB RAM. It comes loaded with 8GB internal memory and supports up to 32GB expandable memory. The Android Smartphone carries an 8MP primary camera and a 2MP front facing secondary camera for you. Want to spend some extra to grab a Smartphone of better specifications? Amazon India presents to you the honor Holly2 Plus which is driven by a 1.3GHz Quad-core processor. The handset packs 2GB RAM and 16GB internal memory. It supports 4G network connectivity and comes equipped with a bright and vivid 5 inch IPS LCD display. Powered by a 4000mAh Li-polymer battery, the Smartphone is a must-have for everyone who loves to be in-action for long hours. With a 13MP primary camera and a 5MP secondary camera, the honor Holly2 Plus lets you capture the beauty of the moment in full details. 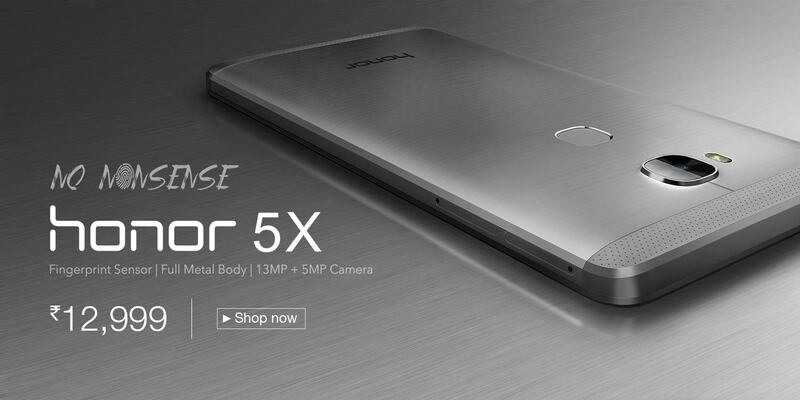 honor 4X is another Smartphone that exceeds your expectations without burning a hole in your pocket. The elegant 4G Smartphone runs on a 1.2GHz Quad-core processor and 2GB RAM. It comes equipped with an 8GB internal memory and supports up to 32GB expandable memory. On the 5.5 inch fully laminated IPS screen you will view all your content in optimum clarity. Take true-to-life images and videos by using the 13MP rear camera. With the 27 mm wide angle lens enriched camera, you can brilliantly capture all the beautiful moments of your life. The Smartphone runs on Android v4.4 KitKat OS and has an Adreno 306 GPU processor in it for excellent gaming and graphical performance. If style and performance are all what you want under a single package, then the honor 5X does the trick for you. It has a full metallic body, the design of which is inspired by famous Guggenheim Museum in Spain. The sleek and robust housing of the device is crafted from aluminum alloy which undergoes four-step finishing processes. The Smartphone comes equipped with a fingerprint sensor that doesn’t just lock and unlock the device, it also allows you to dial a number by linking a fingerprint with a contact. Now, launch an app with a single touch of a finger. Take normal as well as selfie photos with the fingerprint sensor at ease. Pull down the notification bar of the phone just by swiping down the fingerprint sensor. Hide it again with just a double press. Answer an incoming call or cancel an alarm by pressing and holding the fingerprint sensor. The phone is driven by a Qualcomm Snapdragon Octa-core processor that forms a lethal combination with 2GB RAM. With a PC-grade GPU incorporated, the honor 5X can handle 3D games effortlessly. It comes loaded with 16GB internal memory and supports up to 128GB memory expansion. The 5.5 inch full HD display has a pixel density of 400 ppi and arranges for the best viewing experience for you. It boasts dual camera function (13MP primary camera, 5MP secondary camera) and delivers you the best imaging results. Get the advantage of reduced power consumption by 30 percent with Integrated SmartPower 3.0 technology which features an eight-point power saving plan. Love to set standards for others? Bring home the honor 7 Android handset having a full metal body. Its advanced fingerprint sensor requires a smaller fingerprint area and allows for speedy recognition. The Smart Key feature gives faster access to a variety of pre-set apps and shortcuts. The 2.2GHz Kirin 935 processor has an Octa-core heterogeneous algorithm which lets the chip seamlessly balance performance and power. With a 20MP camera, you can now shoot like a pro. The 5.2 inch full HD display makes viewing your favourite movies a whole lot of fun. The Smartphone comes equipped with 3GB RAM and can handle all apps and graphical programs easily. Amazon India gives you full freedom to own an honor product as per your requirements. The honor Brand Store has listings of different honor Smartphones in different colours. Place an order for the one that suits your needs and budget. Enjoy smart image technology, long battery life and remarkable craft packed in to the honor range of Smartphones.